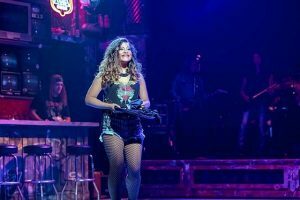 ‘Rock of Ages’ at Drury Lane Oak Brook is a fun 80’s inspired musical romp through the apparently now nostalgic Reagan / G.H.W. Bush era. The ankle-deep plot is reminiscent of the old Beach Party movies of the 1960’s. Basically boy, Drew (Russell Mernaugh) meets girl, Sherrie (Cherry Torres). He aspires to be a rock star. She aspires to be a movie star. The couple’s love affair is interrupted by the intervention of superstar Stacee Jaxx (Adam Michaels) and hijinks ensue. Meantime the evil, Nazi inspired Hertz (George Keating), reluctantly aided by his cowering and outrageously funny son, Franz (Nick Cosgrove), plans to push out the “rockers” and redevelop a portion of the Hollywood Sunset Strip into a European inspired mega-mall featuring all of the popular retail brands. The plan includes taking a wrecking ball to the iconic Bourbon Room, a kind of Urban Cowboy bar run by aging proprietor Dennis (Gene Weygandt) who has not noticed that time has snuck up on him. 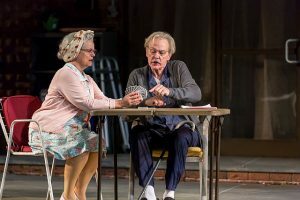 However, the culturally destructive aims of Hertz and Franz are energetically and enthusiastically challenged by the grassroots efforts of Regina – pronounced with a long “I” (Tiffany Tatreau). This musical farce is sped along by the cornball humor and physical antics of Lonny (Nick Druzbanski). Think Svengoolie meets John Belushi. The stage manager/audio tech and keeper of the Fogmaster 5000, acts as a kind of one man Greek chorus. 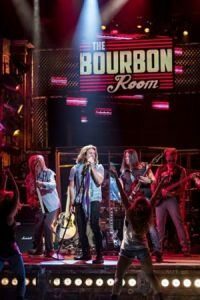 ‘Rock of Ages’ has no religious connotation and the idea that the music of this period has a kind of timelessness is hopeful at best. The story-line is basically an excuse to revisit a series of tunes and pay homage to the theatrically inspired Los Angeles Glam Metal genre whose rhythms are ideal for driving your shopping cart through Target or Walmart which is where you have probably heard most of these songs lately. As the early part of generation X, the 80’s is defined musically by the rise of Madonna, Whitney Houston, Prince and Michael Jackson. The rock bands of the period had names like Guns N’ Roses, Metallica, Iron Maiden, Poison, Megadeth, and Anthrax which this production aptly spoofs. Every member of the cast has the vocal chops required for their individual tasks. Donica Lynn who plays Mother gives us a couple of much appreciated soulful gospel-inspired moments. The voice of Tiffany Tatreau is not lost in the crowd. Her feisty performances alone, and with Adam Michaels, really raise the energy level. 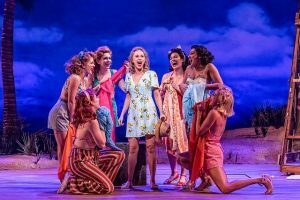 Much of the success of this production is due in no small part to the outstanding rock band led by keyboard/conductor Chris Sargent with guitarists Tom Logan and Dan Peters, Patrick Williams on bass and drummer Rich Trelease. The high point of the evening was their post finale jam played as the audience was filing out. 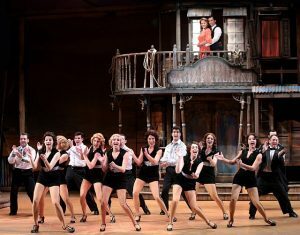 This production lived up to the high standards Chicago audiences have come to expect from The Drury Lane Theatre. Director Scott Weinstein obviously encouraged his performers to have fun. The choreography (Stephanie Klemons) included a cool segment that was reminiscent of the mechanical bull rides that were popular at the time. The set design (Jeffrey D. Kmeic) that incorporated the use of projected images and video was very innovative and effective, while the lighting (Greg Hoffman) captured the techno vibe of the era and contributed to the rock and roll atmosphere. Kudos also to Theresa Ham for some costume surprises and Ray Nardelli for keeping the sound levels appropriate for a theatrical audience while not losing the rock essentials. 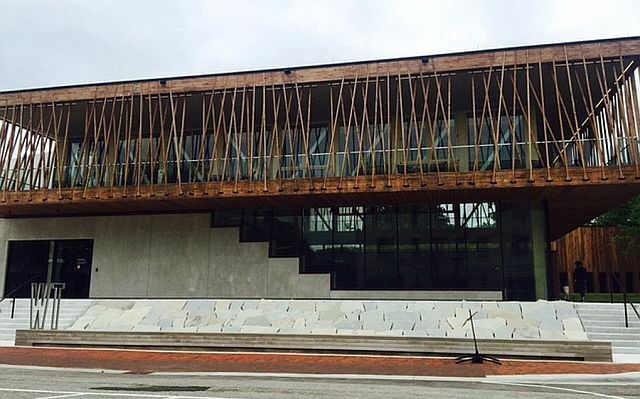 Though not timeless, “Rock of Ages” is an energetic fun filled performance that can be enjoyed by ages 13 and up. DETAILS: “Rock of Ages” is at Drury Lane Theatre, 100 Drury Lane, Oakbrook Terrace, now through Oct. 15, 2017. For tickets and other information call (630) 530-0111 and visit Drury Lane Theatre. Guest reviewer Reno Lovison says, “Don’t Stop Believing.” He is an avocational folky soft-rock singer/acoustic guitarist and video producer who says he was too busy to remember much of the 1980’s. It’s not too early to check out shows that are coming in 2017-18. 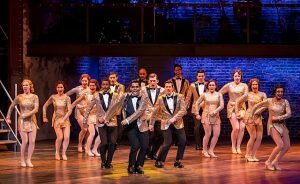 Drury Lane,Oakbrook Terrace, will have theater-goers rockin’, tappin’ and cheerin’ this coming season. Photo courtesy of Drury Lane Theatre. 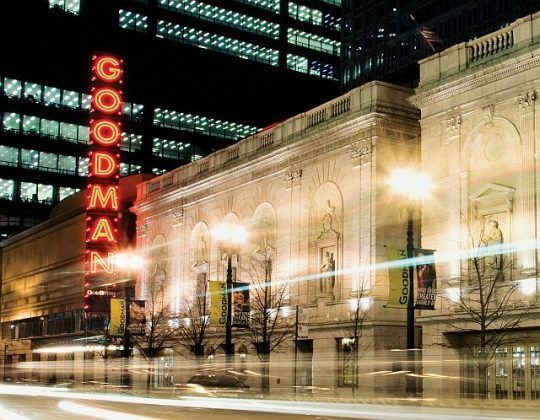 Because Metropolitan Chicago is rich in theatre and entertainment choices, what is happening and where next season is divided into areas. Click northern suburbs season options for that section. City sections will be next. First, take a look at some of the go-to possibilities west of Chicago. They are exciting enough to attract people from other areas in and around the city.